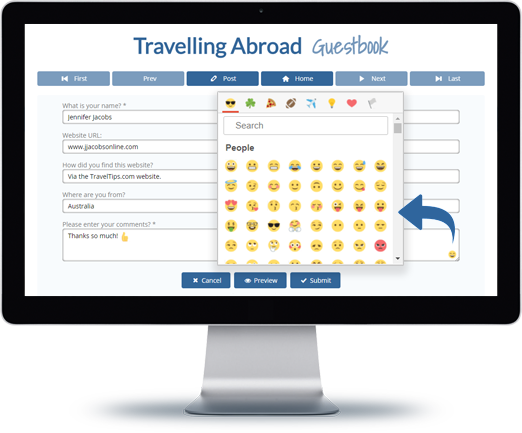 The guestbook web tool is a great way to communicate, connect and engage with your visitors. Your website guests can post messages and you can comment back. The perfect way to get to know your audience and build a community! Get a Bravenet Guestbook for FREE! 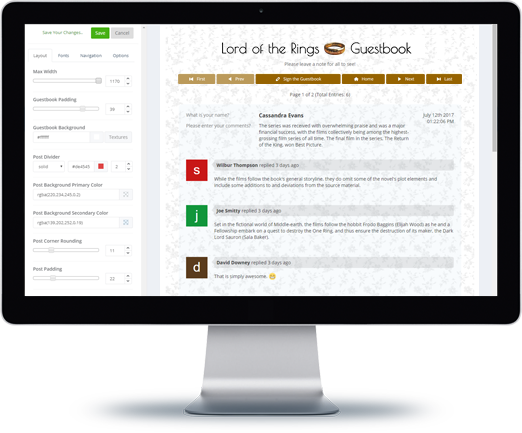 Guestbooks provide interactivity with your website visitors. A guestbook will encourage your viewers to provide testimonials, compliments and comments. And you can learn about what your website visitors are looking for and where they are coming from. Hundreds of smilies and emoticons available for you and your visitors to personalize posts. Turn on smilies and let people choose their favorite emojis as they type... how fun! Turn on viewer comments and allow website visitors to post replies or comments to guestbook posts. By allowing comments, your website visitors can interact. It is a great way to build a community on your site. 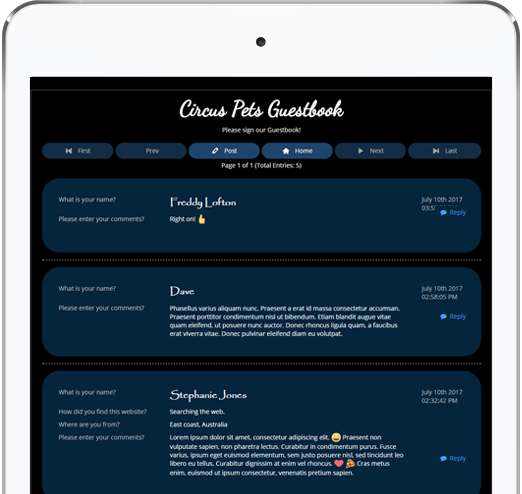 Our new style editor makes customizing your guestbook really simple. 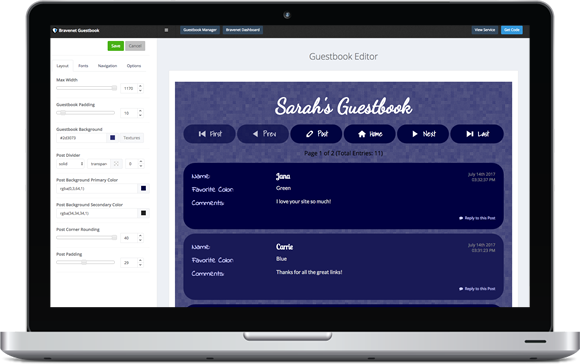 Modify colors, fonts, background, rounding, and a ton of other settings to help you make the perfect guestbook. Change the look of your guestbook anytime you like. Copy and paste our code onto your page of choice and your guestbook will appear for your guests to leave a comment. 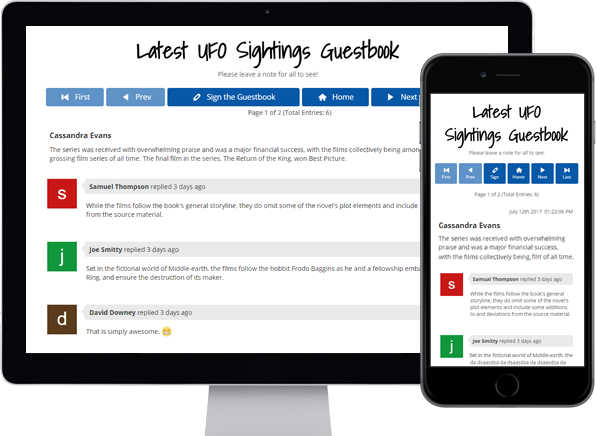 Once your guestbook is live, you can provide a link to your guestbook in your email or blog posts to increase participation with your fans / clients / members. Managing your Guestbook is really easy with the new Guestbook Manager. Customize the look in the builder, edit your service settings, edit the questions you ask your visitors, manage visitor posts and replies, ban unwanted IP addresses and more. any page on your website. colors, icons, buttons and more. creative with HTML in their posts. users by replying to posts. an HTML header and footer. 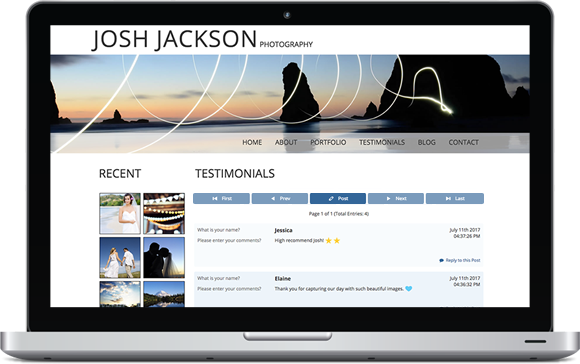 Communicate, connect and engage with your visitors on your website. Get a Guestbook. It's FREE!